Another Interesting Recipe for Blog Hop Wesnesday,this Month i paried with Anamika of "Taste Junction".She's having Nice Space with unique recipes! !I selected Cake ,am a big Cake Lover :) This's a simple cake recipe,serve with Cup of Tea for Evening Snack! !I adjusted sugar to my taste,can reduce it for your taste.I didn't use nuts. Preheat Oven at 370 F ,line a loaf with butter/Parchment paper. Sieve Flour,baking soda and salt ,mix well and keep aside. In another bowl,add milk mix with Coco powder. In a wide bowl,beat butter and sugar till get smooth. Break the eggs and beat till gets fluffy. Now,add flour and milk alternately.Beat well in each addition. Add the coco-milk mixture and vanilla and beat for 1-2 mins. Add nuts,and give a fold. Pour the mixture in greased pan,and bake it for 40-50mins or till baked. Transfer the Cake,in Cool Rake till gets cool.Slice the Cake and Enjoy !! 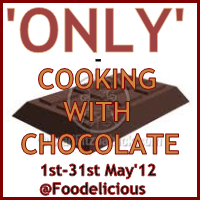 Recipe off to Radika's " Blog Hop Wednesday" and Pari's "Only Cooking with Chocolates"
Thanks for trying...came out quite well! All time fav,choco cake...this with nuts sounds so yummy n u got the perfect texture...looks so yumm!! Happy Mother's day to u too!! Looks so yumm, nice texture..
Wat an incredible loaf cake,looks super moist and yummy. very moist and fluffy cake.. Very yummy and delicious cake. lovely cake uve sliced it so beautifully. following u...do drop by my space too. Hi Prabha I am your new follower the cake looks delicious. I have added my recipe to http://prabhamani-ensamayal.blogspot.com/2012/04/ep-series-herb-spices-ginger-powder.html. Do visit my blog in your free time. Delicious looking cake and well baked. Thanks for linking dear.